Traumatic Incident Reduction - Piedmont Physical Medicine & Rehabilitation, P.A. 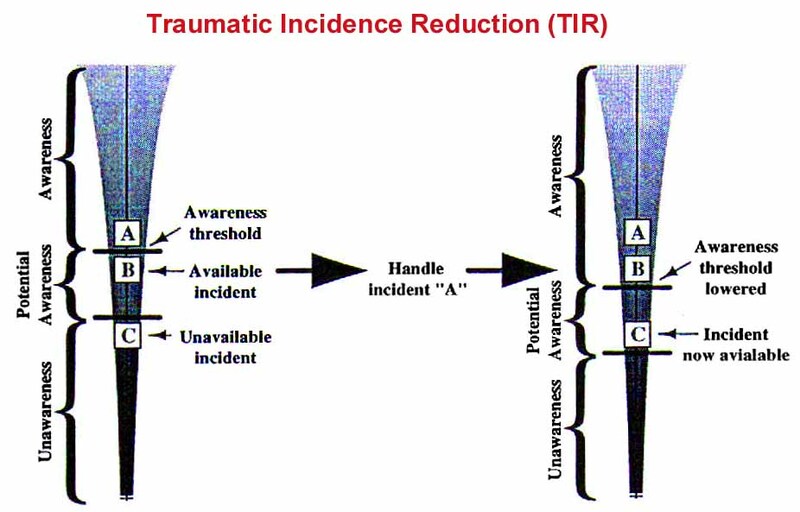 Traumatic Incident Reduction (TIR) is a method by which events that might otherwise be perceived as traumatic are repeatedly revisited. The eventual goal is to disconnect the trauma from the event itself. By utilizing the TIR technique unblocking portions of events can occur or changing one’s relationship to an event can occur. Certain rules make the technique more successful. Do not interpret: Simply accept the event as it is being communicated, retold, or reported. Do not evaluate: There is no role for judgment. If the event is being shared, there must be an understanding that it will remain private. Maintain control and focus: do not stray from the one, single issue or incident until an end point has been reached or resolved to satisfaction. Over time as items are addressed and resolved, the awareness threshold changes such that a portion of the original incident, or newly available incident, becomes available to recall (Figure 1). If an incident is becoming heavier, it is possible that viewing the event has restimulated an earlier yet unexamined one. It is best to complete the TIR process with the original incident prior to moving on to another. When identifying the incident that you want to look at, include the basics such as when, where, and how long it lasted. When recalling the incident, go to the start of it, and make sure you know when it began. This is an important step. Because one of the goals is to control or change perception of the event, it is best not to run over it randomly. It is important to go through the incident a number of times, because at first you will only view the prepackaged, sanitized or comfortable version of the story. Remember facilitation rules 1–3 when playing the incident over again. Close your eyes and focus on what you are aware of. Describe in detail the single frame that is discernable at the designated starting point. Go through the event, silently, to the end, and then simply say (do not analyze) what happened. When utilizing TIR, you do not want to figure the event out, or explain it away. You do, however, want to emotionally engage in the event. When running through it a second or third time, try to experience what you were feeling at the time. See if you can make out/recall any of the words that were spoken. As a general rule, so long as charge is coming off the incident, stay on the same incident. enhanced awareness into the reactions and decisions made is occurring. While many people have relived an event over many times, when practicing TIR it is not enough to live it over again the same way you have in the past. Rather emphasis should be placed upon the details and those portions that are more difficult to recall. Continue the process until even the smallest parts can be seen for what they are instead of what they felt like intertwined with what actually occurred. With practice, and patience, the power that the event holds eventually will subside. Thereafter a different relationship to what occurred, and perception of it, can develop. Adapted from Traumatic Incidence Reduction, by Gerald French and Chrys Harris, CRC Press, 1999.